- Royal glass pair, made of pure quality brass. - Eye catchy floral design makes it unique. - Available in different design and pattern. 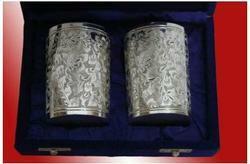 Assisted by our team of hardworking professionals, we are indulged in offering an extensive gamut of 6 Glass Tray Set. 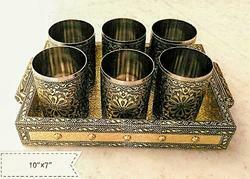 Decorative glass Tray Sets available in Whole sale prices. The stems of these glasses are filled with crystals which are class in itself .